Reference number for this case: 4-oct-54-Chaleix. Thank you for including this reference number in any correspondence with me regarding this case. Chaumont, October 7 (A.P.P) - Mr. André Narcy, a 48-year-old roadmender in Mertrud (the Haute-Marne), went yesterday morning to work on his motorcycle when near Voillecomte at 7:15 a.m. he noticed in a field in the vicinity of the place called "La Vieille-Tuilerie" an orange-colored object. As he approached, he found that he was in the presence of a machine unknown to him . The roadmender stopped his machine and walked to about fifty meters from the object. It was then that he perceived in the vicinity a small being about 1 m. 20 in height and clad in a coat covered with hair. Narcy was very afraid and lay down on the ground and then called the character. The latter, after turning towards him, rushed into his machine; which immediately flew away vertically to get lost in the clouds. According to Mr. Narcy, the craft was spherical in shape with a diameter of about ten meters. Under the sphere was a kind of spindle and the porthole through which the being entered the craft was just between the spindle and the body of the apparatus. At the departure of the latter a kind of flame emerged from the spindle while a great vaporous eddy occurred under the machine. M. Narcy went immediately to his work, where he told his adventure to his comrades. With two of them, Mrrs. Riel and Henry, he returned to the spot where he found that the dew no longer existed on a certain surface. The grass had a slightly milky tint and was crushed on a square about three meters side. In addition, 12 parallel tracks resembling round foot prints were distributed over a certain distance, suggesting that the apparatus had landed in a series of small jolts. A farmer from Chaleix (the Dordogne), Mr. Garreau, said yesterday that he had seen a "flying soup tureen" land on his property. Mr. Garreau said that two perfectly normal men dressed in khaki suits came down and shook hands with him and spoke to him an unknown language. Mr. Garreau, awestruck, did not reply. The two men stroked his dog and climbed back into the aircraft, which flew away noiselessly at a dizzying pace. At the place indicated by Mr. Garreau it was found that the grass had been crushed. At the Verdier (commune of Eyburie) several people saw, on the evening of October 1st, around 10 p.m., a ball of fire in the sky. For a few seconds it illuminated the landscape with a reddish gleam and appearing to follow the course of the Vézère. It disappeared in the direction of Uzerche. Saturday, October 2, in broad daylight this time around 1:30 p.m. in the village of Espartignac, an 8-year-old girl, who was leaving her home to go to school, was frightened by a strange phenomenon. She immediately called her mother, who was able to ascertain the following fact: an object of cylindrical form, extremely brilliant, which seemed to rotate on itself at a very rapid pace, rose vertically in the sky, where it was to disappear. A mason living in the Island of Ré, Mr. Simonnetti, said he saw a luminous sphere about 12 meters in diameter, which oscillated about fifty meters from the ground. Limoges, October 7. -- A farmer of Chalaix (the Dordogne), Mr. Gareau, claimed on his honor, to have seen a "flying soup tureen" come to land on his property. Mr. Gareau stated that two perfectly normal men covered of khaki suits came out of it, shook hands with him and spoke a language unknown to him. Mr. Gareau, amazed, did not answer. The two men caressed his dog and went up in their apparatus which flew away without noise at a vertiginous pace. At the place indicated by Mr. Gareau, it was noted that the grass had been pressed. A mason, residing on the Island of Ré, Mr. Simonetti, has stated to have seen a luminous sphere of approximately 12 meters in diameter, which scintillated at about fifty meters from the ground. The sphere, he said, became red, turned blue and rose vertically very quickly. Two inhabitants of the Island of Ré stated to have been pilot of the same phenomenon. Two Parisian on holiday in the community of Mouchamp, Mr. and Mrs. Laroche, claimed to have seen, at the fall of night, an incandescent sphere. Mrs. Thérèse Fourneret, 23 years old, living in Poncey-sur-Lignon (Côte d'Or) saw Monday evening, a machine come to land in the meadow not far from her residence. She stated that, frightened, she had taken refuge at neighbors'. The gendarmerie noted very clear traces on the ground at the indicated place. Turfs had been torn off and projected in a radius of 4 meters. Mr. Landrin, employee with the Waters in Duclair (the Seine Inférieure) who was wandering in company of his wife, was blinded by a beam of light. When he reopened the eyes, he said, he saw a ball which disappeared a few minutes later. Finally, saucers, flying cigars, crowns and all other objects were seen in St Etienne, in several villages of the Eure et Loir, in Heyrieux (the Isère), Dieulanvallon (the Côtes du Nord), Ajot (the Calvados) and in Biarritz. Testimonies on the flying saucers seem to become increasingly precise. Various people in the same area announce the same phenomenon and one can say that one has assisted for a few days to a true rain of flying saucers, cigars or discs on the entire France. A farmer of Chaleix (Dordogne) Mr. Garreau affirmed on his honor to have seen a flying soup tureen land in his property. Mr. Garreau declared that two perfectly normal men covered of kaki suit descended, shook hands with him and spoke a language unknown to him. Amazed, Mr. Garreau did not answer, the two men caressed his dog and went up in their apparatus which flew away without noise at a vertiginous pace. A luminous sphere 12 meters in diameter was seen in the Island of Ré by a mason, Mr. Simonetin. The sphere, he said, became red after having hovered within 50 meters of the ground, it changed to blue and rose very quickly vertically. The craft was also observed by two Parisian on holiday. Mrs. Thérèse Fourmeret, 23 years, inhabitant of Poncey-sur-l'Ignon (Côte d'Or) saw Monday evening a craft land in a meadow not far from her residence. She declared that frightened, she had taken great care not to observe this phenomenon longer and had taken refuge at neighbors'. The gendarmerie noted very clear traces on the ground at the indicated place. Turfs had been torn off and projected in a radius of four meters. In Duclair (Seine-Inférieure) Mr. Laudrin, employee of the water supplies who was walking with his wife, was dazzled by a ray of light, when he reopened the eyes, he saw a ball that disappeared a few minutes later. LA ROCHELLE, 8. - A mason inhabiting the island of Ré, Mr. Simonnetti, said he saw a luminous sphere 12 meters in diameter which hovered at about fifty meters from the ground. The sphere, has he said, became red, turned blue and rose very quickly vertically. Two other Ré Island residents said they witnessed the same phenomenon. Two Parisians on holiday in the town of Mouchamps, Mr. and Mrs. Laroche, claimed to have seen, in the dark, a glowing sphere. Thérèse Fourmeret, 23, inhabitant of Poncey-sur-l'Ignon (Côte-d'Or), saw a craft to land in a field near his home. She declared that frightened she had been careful to observe this phenomenon longer and sought refuge with neighbors. The gendarmerie noted very clear traces on the ground where indicated. Turfs had been torn off and projected within four meters. A Duclair, near Rouen, Mr. Landrin, attendant to the waters, who was walking with his wife, was blinded by a light beam. When he opened his eyes, he said, he saw a ball that disappeared a few minutes later. Finally saucers, cigars, discs, rings, balls, lights, bright streaks of various colors and all other flying objects have been seen in Saint-Etienne, in several villages of Eure-et-Loire, Dieulanvollon (Côtes-du Nord), in Heyrieux (Isère), in Ajort (Calvados) and Biarritz. A farmer of Chaleix (Dordogne), Mr. Garreau said on his honor that he saw a "flying soup tureen" arise in his property, Mr. Garreau said two perfectly normal men, dressed in khaki suits are down, shook his hand and him spoke an unknown language. Mr. Garreau stunned did not respond. The two men patted his dog and went up in their apparatus which flew away without noise at a vertiginous pace. At the place indicated by Mr. Garreau, it was found that the grass had been trampled. Do we need to mention the furry being, bearing for it around the size a broad corset of orange color, seen close of a saucer by Mr. Narcy, in edge of the road of Wassy (Haute-Marne), October 5 with 7 a.m.. 15 of the morning? And Mr. Jean Labonne, of Bergerac, who, on October 2, at 10 p.m., saw a metal mushroom in his garden. "Who's there?" he shouted when distinguishing a shade. "What do you want from me?" But the shade climbed in the mushroom which rose in the airs at an extraordinary speed. Even in England which started to worry and almost become indignant that not the least saucer, not the least "cigar" or cigarillo, had made the honor of an appearance to the people which had won the battle of Trafalgar. This gap has been just been largely filled by the sensational revelations of an ornithologist, Mr. Cedric Allingham, who claims to have met, on February 18, in the north of Scotland, not a Martian, but a Venusian with whom he had a lengthy and difficult conversation! This Venusian measured about 1 m 73, he had short brown hair, and his skin seemed tanned. He was completely wrapped in a kind of combination which had the appearance of a armored coat. In his nose were two small tubes joined by a metallic wire... Mr. Allingham managed to touch the saucer whose metal was slightly warm, and he finally took the leave of Venusian, not without having offered him his pen, which the man carefully put in a pocket of his combination and after having taken on the run a photograph of the strange character. This rather fuzzy image is, it should be acknowledged, rather unrevealing. One sees the silhouette of a man seen from the back, walking slightly curved, and that, without a little imagination, could easily be matched with the silhouette of any earthman. Lastly, with the latest news, it is a true avalanche of Martians that comes falling on our grounds. In Pournoy La Chétive, in the Moselle, three children were roller skating, when a round machine, of 2.50 meters of diameter, lands close to them. A man left from there, holding in the hand a lit lamp which dazzled the children. He was dressed of a black cassock "like that of our priest", and after having said some unintelligible words, he flew away in his saucer. In the island of Oléron, for the first time, it was two Martian girls who put foot on the ground. It is Mr. Martin, a colonial teacher on holiday, who brings their description to us. They carried small boots and leather gloves, as well as brilliant helmets. They were extremely pretty and nicely agreed to sign an autograph to the teacher. I would take a whole book to bring back all the cases in detail. But all these good people swear to god that they invent nothing. Their entourage echoes that. Him, to invent such a story? A family man known for his respectability... A boy who never drank any drop of alcohol in his life? Come on! So what? Should it be concluded from this that they really saw strange beings, hairy, helmeted, in boots, speaking an incomprehensible language? Do we need to have faith to this story of mysterious green ray which paralyze human beings? Are their accounts, on the contrary, totally invented? Do they rest on a serious basis exaggerated thereafter? Nothing, absolutely nothing in the current state of the collected information which was made available to the public allows to conclude in the sense of the authenticity. The investigations were led as if it were a question of "checking" the statements of the witnesses and not in the spirit to eliminate all the assumptions leading to plausible and relatively simple explanations. These assumptions are numerous, they go from the joke to the hallucination not to mention the optical illusion. To eliminate them, one would need extremely thorough police information, doubled, in all the cases, of a thorough psychological investigation. Then only the facts would remain, logically unexplainable, which would constitute the true file on the Martians. One would then notice that this file is extremely thin, if not non-existent, and that in this business, there is much, far too much, literature. 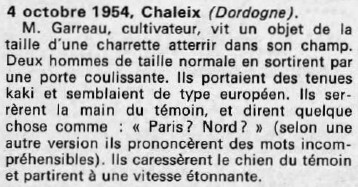 The author indicates that in November 1954, saucer entities patted a little dog belonging to Charles Garreau, of Chalais. Two saucerians dressed in khaki got out of their machine and petted M. Garreau's dog at Chaleis [sic], but elsewhere other flying saucers pilots didn't seem to be dog fanciers. Steinway Hall, 113 7.57 St., N.Y.C. "SAUCER LANDINGS AND LITTLE MEN"
Jimmy Guieu indicates that a farmer from Chaleix, the Dordogne, claimed that on October 4, 1954, he saw that a bell-shaped object with a flat bottom landed on his estate, and that two perfectly normal men dressed in khaki outfit came down, approached him, smiled, shook his hands and talked in a language Garreau could not understand. Stunned, Garreau observed them "while one of them caressed his dog!". The two Uranians immediately climbed back into their craft which took off without noise at a vertiginous speed. Guieu adds that at the place, it was found that the grass had been walked onto, and comments that the skeptics would say this is poor evidence but that "one cannot force" the witness "to provide hard evidence that was not given to him!" The author indicates that among the dubious story on alleged occupants of saucers, there is is the case of Mr. Garreau, farmer in Chaleix, who was alone in his property on October 4, 1954, at an unspecified hour, and sees a "pear-shaped" craft land, which two perfectly normal men dressed in khaki outfit who speak an incomprehensible language to him and go away. The machine flies away at a tremendous pace. The author points out that if Mr. Garreau ignores English one can strongly suppose that they are just American in helicopter, but that unfortunately nothing is detailed in the testimony of Mr. Garreau of which we have only summaries, and thus it is advisable to wait before worrying about this one-of-a-kind testimony. Jacques Vallée said that after a clarification and improvement of his UFO file, there are only two types of creatures reports that remain to be considered, those where the entities are men like in the case of Chaleix, and those with they are "dwarfs with diving suits", and that their real meaning in connection with UFO incidents remains open. Oct. 04, 1954 Chaleix (France). A farmer, Mr. Garreau, saw an object the size of a carriage land in his field. Two men of normal height emerged through a sliding door. They wore khaki overalls and were of European type. They shook hands with the witness and said something like: "Paris? Nord?" (According to another version they spoke indistinct words.) They gave a pat on the back to Mr. Garreau's dog and took off at an amazing speed. (37; Magonia) (Franc-Tireur, l'Aurore, Libération, October 7; France-Soir, Paris-Presse, October 8, 1954). The author indicates that on October 4, 1954, in Chaleix, the Dordogne, France, Mr. Garreau, whom the inhabitants of the country regard as worthy of confidence, has seen a round object which flew, which was of the size of a small truck, and had a little the shape of a cauldron. The object landed in his field, a sliding door opened and two "normal" men dressed in brown working suits, came out of it. They appeared to be European and shook hands with Garreau then asked him: "Paris? In the north?" The farmer was so puzzled that he could not answer, the two men caressed his dog and flew away. The author indicates that on October 4, 1954, a farmer, Mr. Garreau, saw an object of the size of a cart landing in a field in Chaleix in the Dordogne. Two individuals of human type and normal size, dressed in suits, emerged from the apparatus and spoke to the witness in a language which he did not understand. A farmer, M. Garreau, observed the landing of an object as big as a car, from which there emerged two men of normal stature, of European type and wearing khaki overalls. They shook hands with him and said something, variously interpreted as either "Paris?" "Nord?" or something incomprehensible. They patted his dog before re-entering their machine and taking off at amazing speed. Jacques Vallée: Case No. 190 of A century of Landings, in Lumières Dans la Nuit, No 102 (October 1969) and Passport to Magonia. A farmer, M. Garreau, observed the landing of an object as big as a car, from which there emerged two men of normal stature, of European type and wearing khaki overall. They shook hands with him and said something, variously interpreted as either "Paris? Nord?" or something incomprehensible. They patted his dog before re-entering their machine and taking off at amazing speed. October 4, 1954, Chaleix (Dordogne). Mr. Garreau, a farmer, saw an object the size of a cart landing in his field. Two men of normal height emerged through a sliding door. They wore khaki uniforms and seemed of European type. They shook hands with the witness, saying something like: "Paris? Nord?" (according to another version they pronounced incomprehensible words). They stroked the witness' dog and left at an astonishing speed. "In Chaleix, a farmer saw an object of the size of a cart landing in his field. Two men, of normal size, came out of it through a sliding door. They wore kaki overalls and seemed of European type. They shook hands with the witness and said something like "Paris?, North?" (according to another version they pronounced incomprehensible words). They cuddled the witness' dog and left at an astonishing speed." They note that this at the very least odd story lets appear the presence of a "machine" and its occupants, and that the machine is described sometimes like a cart, is announced by Jimmy Guieu in his book "Black-out on the flying saucers" as having the shape of bell, and in another catalogue, it is described as a circular apparatus, and that it is thus delicate, without having a precise testimony, to define the shape of what this peasant saw. They indicate that they have interrogated Mr. Garreau who remembered that it was the evening, at night fall, but that his memory is vague in his mind, that he has few details to provide, for he very badly distinguished it, as a gray shape in the twilight. About the occupants, he indicates that they were of normal size, "like you and me... No, they did not wear helmets, they were dressed in kaki color... yes, normal people... they did not shook hands with me, they did not even talk to me. The departure... I do not remember anymore." The two authors deduce from it that he perhaps observed soldiers and their helicopter, or any other apparatus since Mr. Garreau saw neither the arrival nor the departure. It is said to have been a misinterpretation: the landing of a NATO helicopter. "A Dordogne farmer saw 'Martians' again yesterday. According to him, they were two normal men, of European type, dressed in khaki overalls. They came down from an object which had landed in the vicinity, approached the farmer and shook his hand, asking him: 'Paris-nord?' Awed by stupefaction, the farmer was unable to answer. The two strangers stroked his dog and boarded their engine. They lighted up some kind of electrical lighting and the apparatus flew away rapidly and noise lessly, without smoke or spark, at a dizzy speed. Owing to fog and semi-darkness, the witness was unable to observe exactly, and gave the following description: The object had the trunk of a big cart, and the form of an oval 'oval soup-tureen' steamlined to the front." 43. 43. Paris, France. Paris-Presse. 8 October 54. Also: Paris, AFP Radioteletype in French to the Americas, October 7, 1954. 0438CMT--E. Copy in author's files. These skeptic authors indicate that on October 4, 1954, in Chaleix, Dordogne, France, a cauldron-shaped object about the size of a small truck landed in one Mr. Garreau's field, then a door opened and two normal European-looking men in brown coveralls emerged and shook hands with him. They asked, "Paris? North? ", and the farmer was so shocked he did not reply. The beings then stroked his dog before they flew off. The authors indicate that their source is Jacques Vallee, Passport to Magonia, 1969, page 226. The Belgian ufologist indicates in her catalogue that in 1954, on October 4, in France in Chaleix, "Mr. Garreau, farmer, saw an object of the size of a cart landing in his field. Two men of normal size emerged by a sliding door. They wore kaki outfits and seemed of European type. They shook hands with the witness and said something like 'Paris? North?' (according to another version they uttered incomprehensible words). They caressed the witness' dog and left at an astonishing speed." She indicates that the source is "Jacques Vallée: 'Chronique des apparitions ET' - DENOEL 1972 - J'AI LU COLL. - p. 267." She indicates that another version is: "while he is alone on his property, at an unspecified hour, he sees a 'pear-shaped' craft land. Two perfectly normal men emerge, dressed in khaki outfit: they speak an incomprehensible language to him and go away. The craft flies away at a vertiginous speed." She indicates that the source for this version is "Michel Carrouges: 'Les apparitions de Martiens' Fayard pub., 1963, p.99." She indicates still another version: "a large 'flying soup tureen' big as a tipcart, lands in the fields of the witness. Two men of European type dressed in khaki outfits. After having shaken hands of the witness one of them asked 'Paris? North?' Amazed the witness then sees the craft disappearing at a vertiginous speed." She indicates the source as "GESAG, bulletin #106, March 2001, page 5". Lastly, another version is that: "IN REALITY: It would be a mistake: landing of a NATO helicopter." This last version is sourced "M. FIGUET/ J.L. RUCHON: 'Ovni, Premier dossier complet...' Alain Lefeuvre pub. 1979, p. 664, 665." M Garreau, a farmer, saw a flying saucer land on his property. A sliding door opened and 2 normal men wearing khaki coveralls descended and shook Garreau's hand; they spoke to him in an unknown language, and petted his dog. Then they returned to their machine, which flew away at vertiginous speed. 1954/10/04 CHALEIX, 24, FR: Landed NATO helicopter with men in khaki suits. 1954 - Mr. Garreau, a farmer in Chaleix, France saw an object the size of a carriage land in his field. Two men of normal height emerged through a sliding door. They wore khaki overalls and were of European type. They shook hands with the witness and said some thing like: "Paris? Nord?" (According to another version they spoke indistinct words.) They gave a pat on the back to Mr. Garreau's dog and took off at an amazing speed. (Sources: Liberation, October 7, 1954; Jacques Vallee, Passport to Magonia: A Century of Landings, p. 217). In Chaleix (France), Mr. Garreau (farmer) sees an object of the size of a cart land in his field. 2 men of normal size come out of it by a sliding door. They wear khaki outfit and seem of European type. They shake hands with the witness, and say something like: Paris? North?. They caress the witness' dog and leave at an astonishing speed. Jérôme Beau indicates as sources: "Franc-Tireur, l'Aurore, Libération, October 7, France-Soir, Paris-Presse, October 8, 1954". The website indicates that on 4 October 1954 in Chaleix, France, there was a "Close encounter with a an unidentified craft and its occupants. Explanation: Manmade." The website adds: "One orange helicopter-like, about 20 feet across, was observed by one male witness on a farm briefly. Two 5.5-foot-tall humanoids, each wearing a khaki suit, were seen." And: "M Garreau, a farmer, saw a flying saucer land on his property. A sliding door opened and 2 normal men wearing khaki coveralls descended and shook Garreau's hand; they spoke to him in an unknown language, and petted his dog. Then they returned to their machine, which flew away at vertiginous speed." The sources are indicated as: Webb, David, HUMCAT: Catalogue of Humanoid Reports; Guieu, Jimmy, Flying Saucers Come from Another World, Citadel, New York, 1956; FSR, FSR (formerly Flying Saucer Review), FSR, London, 1966; Bowen, Charles, The Humanoids: FSR Special Edition No. 1, FSR, London, 1966; Pereira, Jader U., Les Extra-Terrestres, Phenomenes Spatiaux, Paris, 1974; Vallee, Jacques, Computerized Catalog (N = 3073); Vallee, Jacques, Challenge to Science: The UFO Enigma, Henry Regnery, Chicago, 1966; Vallee, Jacques, Preliminary Catalog (N = 500), (in JVallee01); Vallee, Jacques, A Century of Landings (N = 923), (in JVallee04), Chicago, 1969; Vallee, Jacques, Passport to Magonia, Henry Regnery, Chicago, 1969; Schoenherr, Luis, Computerized Catalog (N = 3173); Carrouges, Michel, Les Apparitions de Martiens, Fayard, Paris, 1963; Delaire, J. Bernard, UFO Register Volume 7 (1976), Data Research, Oxford, 1976; Newspaper Clippings; Civilian Saucer Intelligence-New York; Hatch, Larry, internet data; Rosales, Albert, Humanoid Sighting Reports Database. The website indicates that on 4 October 1954 in Chaleix, France, "An object the size of a carriage landed. Two men of normal height emerged." The website adds: "Mr. Garreau, a farmer in Chaleix, France saw an object the size of a carriage land in his field. Two men of normal height emerged through a sliding door. They wore khaki overalls and were of European type. They shook hands with the witness and said some thing like: "Paris? Nord?" (According to another version they spoke indistinct words.) They gave a pat on the back to Mr. Garreau's dog and took off at an amazing speed." And: "A farmer, Mr. Garreau, saw an object the size of a carriage land in his field. Two men of normal height emerged through a sliding door. They wore khaki overalls and were of European type. They shook hands with the witness and said something like: "Paris? Nord?" (According to another version they spoke indistinct words.) They gave a pat on the back to Mr. Garreau's dog and took off at an amazing speed." And: "An object was observed. Physiological effects were noted. One changing color domed disc, about 20 feet across, was observed by three male witnesses in a forest for ten minutes. No sound was heard. Four dwarves were seen." The sources are indicated as: Bowen, Charles, The Humanoids: FSR Special Edition No. 1, FSR, London, 1966; Vallee, Jacques, Computerized Catalog (N = 3073); Vallee, Jacques, Challenge to Science: The UFO Enigma, Henry Regnery, Chicago, 1966; Vallee, Jacques, A Century of Landings (N = 923), (in JVallee04), Chicago, 1969; Schoenherr, Luis, Computerized Catalog (N = 3173); Hatch, Larry, *U* computer database, Author, Redwood City, 2002. A farmer Mr Garreau saw a bell shaped object, the size of a carriage, land in his field. Two men of normal height emerged through a sliding door. They were European looking men wearing khaki overalls. They shook hands with Garreau and same something indistinct, which Garreau thought sounded like “Paris Nord?” They gave his dog a pat on the back, then re-entered the craft, which took off at an amazing speed. Vallee Case 190, citing Franc-Tireur + L’Aurore + Liberation all 7 October 1954 + France Soir + Paris Presse 8 October 1954 + Vallee 1969 p.146. Heiden citing Carrouges 1967, p.130 + Pereira 1966, p.195. LDLN 126, p.24 suggests this might have been a helicopter and pilot. The author says that "in his masterly Passport to Magonia", Jacques Vallée cites the case of Monsieur Garreau from Chaleix, Dordogne, who, on 4 October 1954, saw a “cauldron-shaped” object, the size of a “small truck” land in his field, out of which came two “normal” — European-looking — men wearing brown overalls, who shook hands with the startled witness and abruptly asked "Paris? Nord?". Garreau was so shocked he could not answer. The men stroke his dogs and climbed in their craft and flew off. The author wonders why these events and the question asked was so pointless, why the "men" did not wait for Garreau to answer, and why they would fly in such a superior craft and not have navigational aid on board to find their way. The author concludes the whole event must have been "staged" just "to cause consternation" or to alert on the existence "of the weird" and other worlds. *Oct. 4, 1954 - Mr. Garreau, a farmer in Chaleix, France, saw an object the size of a carriage land in his field. Two men of normal height emerged through a sliding door. They wore khaki overalls and were of European type. They shook hands with the witness and said some thing like: "Paris? Nord?" (According to another version they spoke indistinct words.) They gave a pat on the back to Mr. Garreau's dog and took off at an amazing speed. (Sources: Liberation, October 7, 1954; Jacques Vallee, Passport to Magonia: A Century of Landings, p. 217, case # 190). M. Garreau, who was regarded as trustworthy by local residents, saw a round flying object, the size of a small truck, shaped somewhat like a cauldron. It landed in his field, and a door slid open. Two “normal” men in brown coveralls came out. They looked like Europeans and shook hands with Garreau. Then they asked, “Paris? North?” The poor farmer was so taken aback that he did not answer. The two men stroked his dog and flew away. Landed NATO helicopter with men in khaki suits. Mr. Garreau, a farmer, saw a machine the size of a cart, or in the shape of a bell rounded at the base according to another source, land on his field. Two men of normal size came out by a sliding door. They wore khaki suits and looked European. They approached the witness, shook hands and said something like "Paris? North?". According to another version, they pronounced words in a language that he could not understand. One of them stroked Mr. Garreau's dog, and then they re-entered the craft which flew at a dizzying pace. The sources are given as Jimmy Guieu, "Black-Out sur les Soucoupes Volantes", page 165; Michel Carrouges, "Les apparitions de Martiens", page 99. Julien Gonzalez indicates that in reality this case would have been explained since then as the landing of a helicopter of the forces of the N.A.T.O., according to Lumières Dans La Nuit, #126, page 24. This database records this case 17 times! [---] Newswire by Agence France Presse (AFP), Paris, France, October 7, 1954. [---] Article in the national newspaper Franc-Tireur, Paris, France, October 7, 1954. [---] Article in the national newspaper L'Aurore, Paris, France, October 7, 1954. [---] Article in the national newspaper Libération, Paris, France, October 7, 1954. [pc1] Article in the regional newspaper Le Populaire du Centre, Limoges, France, page 1, October 8, 1954. 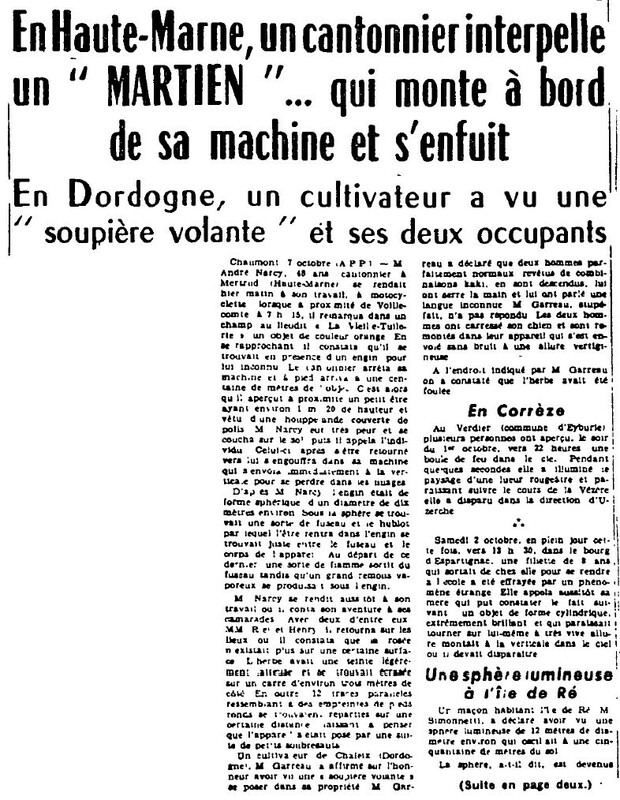 [vr1] Article in the regional newspaper Var-Matin République, France, October 8, 1954. [---] Article in the national newspaper France-Soir, Paris, France, October 8, 1954. [---] Article in the national newspaper Paris-Presse, Paris, France, October 8, 1954. [ql1] Article in the regional newspaper Le Quotidien de La Haute-Loire, France, October 9, 1954. [fa1] Article in the foreign newspaper Feuille d'Avis, Neuchatel, Switzerland, October 11, 1954. [ss1] Article in the national weekly newspaper Samedi-Soir, Paris, France, October 14, 1954. [---] Article in the newspaper Echo-Soir, Oran, Morocco, October 15, 1954. [---] Article in the weekly national newspaper Samedi-Soir, France, October 15, 1954. [hw1] "Flying Saucers Uncensored", book by Harold T. Wilkins, Pyramid Books publisher, U-K., page 248, 1954. [gb1] "Troubled European Skies, article by Gray Barker, in his flying saucers magazine The Saucerian, Gray Barker editor, USA, Vol. 3, No 2, page 22, Spring 1955. [tb1] Lecture by Ted Bloecher, ufology group Civilian Saucer Intelligence (CSI), USA, January 28, 1956. [jg1] "Black-Out sur les Soucoupes Volantes", book by Jimmy Guieu, Fleuve Noir publishers, France, pp 187-188, 1956. [jg1] "Flying Saucers Come from Another World", book by Jimmy Guieu, Citadel publishers, USA, 1956. [mc1] "Les Apparitions de Martiens", book by Michel Carrouges, aka Louis Couturier, Fayard publisher, France, pages 80,99, 1963. [---] Richard Heiden, ufologist, USA. [jv8] "A Descriptive Study of the Entities Associated with the Type 1 Sightings", article by Jacques Vallée, in the ufology magazine Flying Saucer Review (FSR), U-K., Volume 10, #4, page 8, January / February 1964. [jv6] "The 'Entities': the Facts and the Legend", article by Jacques Vallée, in the ufology magazine Flying Saucer Review (FSR), U-K., #3, page 22, May 1964. [jv1] "Un Siècle d'Atterrissages", article by Jacques Vallée in the ufology magazine Lumières Dans la Nuit (LDLN), France, #43. [jv2] Summary by Jacques Vallée in "The Humanoids: A Survey Of World-Wide Reports Of Landings Of Unconventional Aerial Objects And Their Alleged Occupants", book by Charles Bowen, Neville Spearman publisher, U-K., 1969. [jv1] "Passport To Magonia - On Ufos, Folklore, and Parallel Worlds", book by Jacques Vallée, Contemporary Books publishers, USA, 1969. [jg1] "Black-Out sur les Soucoupes Volantes", book by Jimmy Guieu, Omnium Littéraire publishers, France, pp 187-188, 1969. [jv3] "Passport To Magonia - On Ufos, Folklore, and Parallel Worlds", book by Jacques Vallée, Contemporary Books publishers, USA, 1969. [gf1] "The effects of UFOs on Animals, Birds, and smaller creatures - Part 3", catalogue by Gordon Creighton, in the ufology magazine Flying Saucer Review (FSR), U-K., Volume 16, #3, 1970. [gc3] "UFO Effects on Animals - Part 3", article by Gordon Creighton, in the ufology magazine Flying Saucer Review (FSR), U-K., Volume 16, #3, 1970. [---] "The Age of Flying Saucers: notes on a projected history of unidentified flying objects", book by Paris Flammonde, Hawthorn Books publishers, page 65, 1971. [ge1] "Listes des Cas d'Observations d'Occupants (suite)", based on Jader U. Pereira, in the ufology magazine Phénomènes Spatiaux, GEPA, France, #29, page 19, September 1971. [jv1] "Chronique Des Apparitions Extra-terrestres", French translation of "Passport to Magonia", book by Jacques Vallée, Denoël publisher, France, pp 214-215, 1972. [jv3] "Chronique Des Apparitions Extra-Terrestres", French translation of "Passport to Magonia", book by Jacques Vallée, Denoel publisher, France, page 268, 1972. [---] Ufology magazine Lumières Dans La Nuit (LDLN), France, #126, page 24, June 1973. [---] "Les Extra-Terrestres", booklet by Jader U. Pereira, Phénomènes Spatiaux, GEPA, France, page 195, 1974. [---] "UFO Register", book by J. Bernard Delaire, Data Research, U-K., 1976. [---] "HUMCAT: Catalogue of Humanoid Reports", compiled by David Webb and Ted Bloecher, CUFOS, USA, circa 1978. [fr1] "OVNI, Premier Dossier Complet des Rencontres Rapprochées en France", book by Michel Figuet and J.L. Ruchon, Alain Lefeuvre publisher, France, pp 664-665, 1979. [bb1] "La Grande Peur Martienne", book by Gerard Barthel and Jacques Brucker, Les Nouvelles Editions Rationalistes publishers, pp 65-66, 1979. [lg1] "The Fifth Horseman of the Apocalypse - UFOs: A History - 1954 October", monography by Loren E. Gross, USA, page 9, 1991. [bh1] "UFOs And Alien Contacts - Two Centuries Of Mystery", book by Robert E. Bartholomew and George S. Howard, Prometheus Books publishers, New York, USA, page 299, 1998. [---] GESAG ufology bulletin, Belgium, #106, page 5, March 2001. [---] List of "discredited UFO sightings", compiled by Larry Hatch, USA, circa 2002, was on the Internet. [lh2] "A Short List of Discredited UFO Sightings", by Larry Hatch, in the ufology bulletin The IUFOMRC Newsletter, USA, page 3, September 2003. [dj1] "Encounters With Aliens On This Day", web page compiled by Donald Johnson, USA, circa 2005, at www.ufocat.com. [lp1] "The Mammoth Book of UFOs", book by Lynn Picknett, Constable & Robinson publishers, U-K., page 12, 2012. [gz1] "RR3 - Le Dossier des Rencontres du Troisième Type en France", book by Julien Gonzalez, Le Temps Présent publishers, France, page 433, 2014. 0.1 Patrick Gross March 27, 2003 First published. 1.0 Patrick Gross March 16, 2009 Conversion from HTML to XHTML Strict. First formal version. Additions [mc1], [go1], [dj1], [jb1], [ud1], [ud2]. 1.1 Patrick Gross June 22, 2010 Addition [jv5]. 1.2 Patrick Gross July 6, 2010 Addition [jv6]. 1.3 Patrick Gross August 13, 2013 Addition [pr1]. 1.4 Patrick Gross September 29, 2014 Additions [jv8], [jv7], [gc3], [ge1], [lh2], [ni1], [ta1]. 1.5 Patrick Gross October 17, 2016 Addition [fa1]. 1.6 Patrick Gross December 8, 2016 Additions [gb1], [tb1], [lg1], [ub1]. 1.7 Patrick Gross December 24, 2016 Addition [pc1]. 1.8 Patrick Gross February 20, 2017 Addition [gz1]. This page was last updated on February 20, 2017.